Although popularly known as one of Thailand’s best beach destinations, Phuket offers so much more than its beautiful clear blue waters and its lush forest. A beach bum can easily spend hours lying on the powdery sand beaches while waiting for the picturesque sunset, but if you’re an adventurous traveler, a holiday in Phuket involves a whole lot more activities than getting a tan and practising your backstroke! Here’s our Phuket guide for all the fun activities you can do while on the island! Hanuman World Phuket is one of the famous Phuket tourist attractions especially for adrenaline junkies! 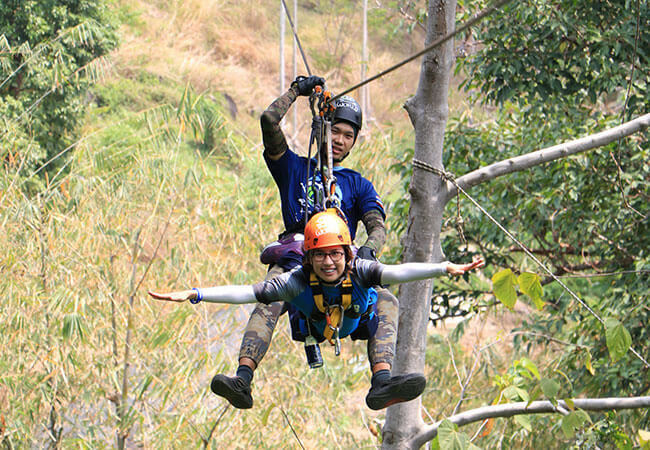 It’s an Eco Adventure Park located to the west of Phuket Town which offers a safe treetop zip lining adventure. Choose from the 16 exhilarating lines with up to 400 meters in length or you can also take your time traversing the forest canopy with the adventure park’s sky walk. Hanuman World Phuket is a great way to enjoy Phuket sightseeing and be closer to nature with the surrounding ancient trees and hillside jungle. Phuket ATV is Thailand’s most established ATV company that boasts a 350 acre land of terrain – the perfect space for a four-wheel adventure! When you arrive at the ATV camp, the staff will brief you regarding safety information and how the ATV works. You’ll be given a helmet and gloves then off you go with your adventure! Expect to go through some difficult terrain – narrow tracks, muddy puddles and some up and down inclines. 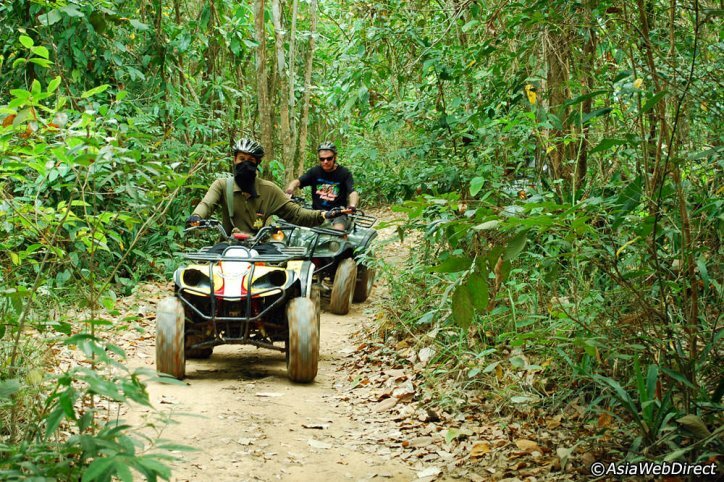 During the two-hour adventure, you can either ride as a passenger or you can choose to drive the ATV by yourself. You can also split up into groups – depending on your ability to handle the ATV. Muay Thai is one of Thailand’s most popular sport which has been attracting some interest worldwide. For travelers who come to Thailand and want to experience watching the action live, the stadium on Soi Sai Namyen in Patong Beach area is a good place to catch some elbow striking punches and lethal kicks. 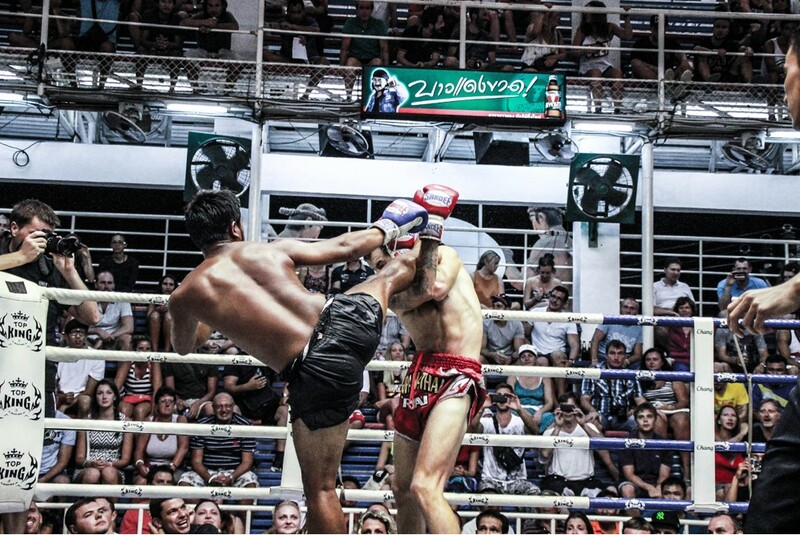 You wouldn’t want to miss out the action-packed sport while in Thailand right? Make it one of the highlights of your Phuket trip! 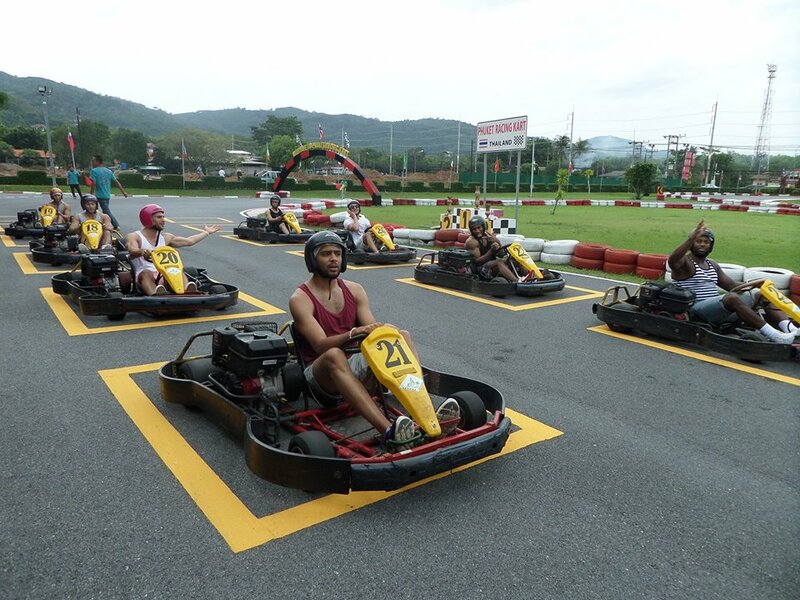 If you’re spending a holiday in Phuket with your friends, there’s no better way to enjoy some fun competition than challenging who is best at racing kart! The Phuket Racing Kart is a huge 700-meter track with an electronic transponder-based system that tracks your time. Before going behind the wheel, you’ll be given safety briefing and helmets will be provided. As part of the Phuket Shooting Range complex, aside from the Phuket Racing Kart, you can also enjoy some afternoon where you and your friends can aim and fire some automatic and semi-automatic weapons. Other activities also include ATV rides, snake shows and paintballing. There’s also a café and a souvenir shop for some memorabilia to take home! 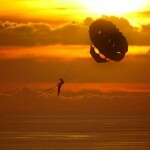 One of the most unique things to do in Phuket, Thailand is try Paramotoring! 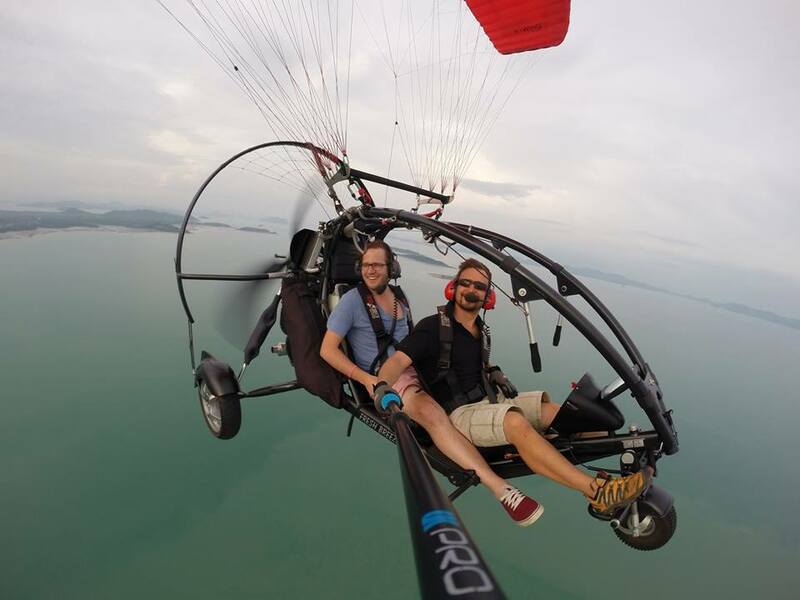 This activity lets you see the island in a different view, one which is from high up in the sky while driving a paramotor or what is also called a powered paraglider. Sky Club Asia was first established in Hua Hin 2007 and opened a branch in Phuket in 2013. 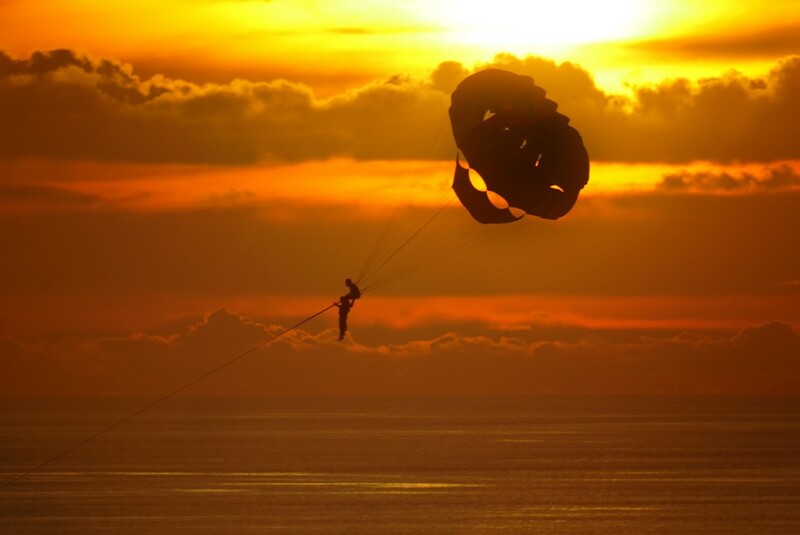 Sky Club which is located on the east coast of Phuket is often visited by enthusiasts who have been flying with paramotors – mostly started with paragliding. If you don’t have any experience at all, you can take the Tandem flights made especially for those who don’t have the desire to learn to fly alone. 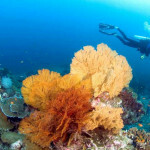 Expect an adventure filled holiday in Phuket if you include these activities in your itinerary. Check out flight booking and schedule at Bangkok Airways and start planning your trip! Meanwhile, you can look for other holiday destinations by visiting our blog.